Last week we witnessed Jesus in the synagogue teaching with authority and healing a man with an unclean spirit. News of the success of Jesus' ministry is traveling like wild fire. No surprise there! In today's reading we pick up where we left off last week. "As soon as they left the synagogue; they entered the house of Simon and Andrew, with James and John." The healing ministry of Jesus continues as Jesus learns that Simon's mother-in-law is in bed with a fever. Jesus takes her by the hand, and lifts her up. She is healed and responds by serving Jesus and others who are there. That evening the whole city gathers outside to see what Jesus is doing. He cures many who are sick and casts out many demons. Then, we are told, Jesus goes out to a deserted place to pray early, early in the morning. I invite you to sit with this reading from the Gospel of Mark. You might like to nestle in your favorite chair or even go outside on this lovely day. Slowly read the Scripture, aloud or silently. What do you draw from this first reading? What jumps out at you? About what would you like to know more? Consider jotting down your thoughts. Then, prayerfully read the text a second time, but now imagine that you are Simon's mother-in-law. How do you experience the reading as a person healed by Jesus? How do you respond? Finally, read through the text one final time imagining that you are Simon Peter. You witness Jesus healing your mother-in-law. You see all those people crowding at the door. Everyone is abuzz with what is happening in your home town. But in the morning when you look around for Jesus, he has disappeared. What are your thoughts and feelings about what is happening all around you? I hope this time of reflection will feed your thoughts and prayers as you journey toward Sunday. I look forward to seeing you in worship. Until then, may you experience the joy and peace of Christ's presence in your life. The Lectionary readings for this coming Sunday include Psalm 111 and Mark 1:21-28. Our reading from the Gospel of Mark last week ended with Jesus calling four fishermen. The motivation behind calling Simon, Andrew, James and John was so that Jesus might teach them to become fishers of people. Then, seemingly in an instant, while Zebedee is still sitting in the boat trying to figure out what just happened, they go to Capernaum. Jesus enters the synagogue and then, my oh my, do things ever get interesting. Take some time this week to sit with this passage from God's word. Read it through once, and then listen carefully for what God might be saying to you this day. Too often we think that God's word was for "those people" in "that time," but God's word is for all people in all of time. What strikes you about this scene in the synagogue? Then, putting yourself in the story as a scribe, read through the text again. Although the text does not tell us whether or not a scribe was even present, still I invite you to enter the story as an accepted authority of the time. How might you hear the story differently as one who is often looked to as "the person with all the answers"? Are you drawn to Jesus? Are you jealous of Jesus? Finally, read the story and try to imagine that you have been rejected by the people. Perhaps you have a disease or some other situation that causes you to be perceived as "unclean." Maybe you have entered quietly into the synagogue on the Sabbath, hopeful that no one will notice you and throw you out. You haven't heard anything about Jesus beforehand, so you are amazed at his teaching--as are so many others in the room. How do Jesus' words and actions impact you? Does Jesus bring hope into the room? Thankfully, then, as now, Jesus has a message for each and every broken person (and make no mistake, that means all of us). As always, I look forward to seeing you in worship on Sunday. How fitting that this week we will have a Service of Healing and Wholeness. Let us gather together and claim the healing power that is still Jesus' to impart! The lectionary readings for Sunday, January 22nd include Jonah 3:1-5 and Mark 1:14-20. For the past few months I have been hoping to get a few pastors in the area together to begin a lectionary group. Today was our first meeting and what a wonderful time we had delving into God's word and sharing with one another. Together we focused on the Gospel of Mark, which takes us to the beginning of Jesus' ministry in Galilee, following the arrest of John the Baptist. Jesus goes to Galilee and as he walks alongside the sea, he calls two sets of brothers to come join him. And they do, just like that, it seems. Reading this story with other pastors took me back to a beautiful, sunny day in 2009 when I was on a pastoral pilgrimage to the Holy Land. 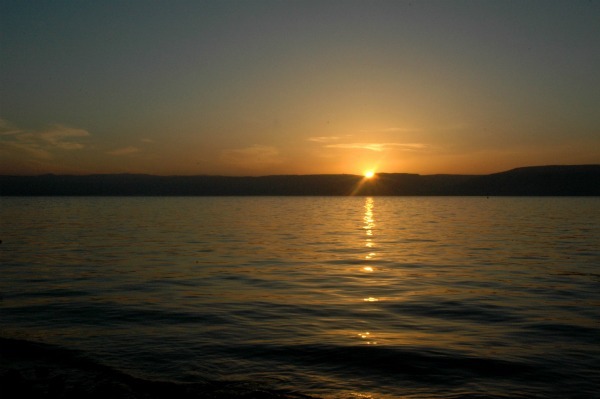 Walking along the bank of the Sea of Galilee, a holy presence was nearly palpable. I could almost hear Jesus' voice to those would-be disciples, "Come, follow me, I will make you fish for people." What must it have been like for Zebedee to witness his sons leaving him and his fishing business? Why isn't Zebedee called as well? What is so compelling about Jesus that these young men are so willing to follow him? Have they met him before? On the journey toward Sunday, I invite you to take some time to read Mark 1:14-20. Read it once and then simply sit and consider what God might be saying to you through these words. Then, prayerfully read the text again, but this time imagine that you are John. As John, how do you hear these words? As John, how are you affected by Jesus? You might like to take some time to write down your thoughts (perhaps in a prayer journal). Now, once more read the text and this time imagine you are Zebedee. What are your thoughts as you see your sons leave the boat, leaving you in the process? May God bless you this week. As always, I look forward to seeing you in worship on Sunday. And I look forward to meeting with friends in ministry next week to examine God's word as I journey toward preparing another sermon. God is good! Our readings for this Sunday include I Samuel 3:1-10 and John 1:43-51, both of which are call stories. During the night, the voice of God repeatedly calls Samuel. Through Philip, Nathaniel hears about Jesus and goes to see for himself, “Can anything good come out of Nazareth?” While our call to service may not come as dramatically as either of these stories, still each baptized believer is given kingdom work to do on behalf of our Lord. This Sunday we have the grand opportunity of celebrating the ordination and installation of our new class of Elders. Four individuals have heard the call to help lead our church forward. Praises be offered! As you prepare for worship, take some time to meditate on Sunday’s readings. Then consider Psalm 139:1-6, 13-18. In this beautiful psalm, the theme of being known by God continues. No matter where we are—asleep in the middle of the night (like Samuel) or sitting under a fig tree (like Nathanael) God knows where we are. Is there anything more comforting to know? Dietrich Bonhoeffer, who was martyred for his beliefs during WWII, wrote this beautiful poem that reiterates who we are and whose we are. Calmly, cheerfully, firmly, Like a squire from his country-house. Freely and friendly and clearly, As though it were mine to command. Equally, smilingly, proudly, Like one accustomed to win. Am I one person today and tomorrow another? Am I both at once? On your journey toward Sunday, may you listen for God’s voice and may you know that no matter what, you are known and loved by God. I look forward to seeing you during worship on Sunday. The Scripture readings for Baptism of the Lord Sunday are Genesis 1:1-5 and Mark 1:4-11. ﻿Our reading from Genesis takes us to the beginning of creation when, at the voice of God, order comes forth out of chaos. A new world is created and a new day begins. Fast-forward through time and we are once again by the water's edge. This time there is a man crying out in the wilderness, proclaiming a baptism of repentence for the forgiveness of sins. John the Baptist says that one more powerful than himself is coming. "I am not worthy to stoop down and untie the thong of his sandals. I have baptized you with water; but he will baptize you with the Holy Spirit." Then, while the words still linger in the air over John's head, Jesus appears on the banks of the Jordan River, as if on cue. And, of all things, he wishes to be baptized. What echoes of the Genesis creation account can be heard in the baptism of Jesus account? Mark provides background for the doctrine of the Trinity. How so? Water is critical to life. How does flowing water and baptismal waters compare? When you think of your own baptism, what feelings rise to the surface? How often are you reminded of your baptism? On the church calendar, this Sunday marks Baptism of the Lord Sunday. During worship, an opportunity will be provided for each of us to reaffirm the covenant of baptism. On your journey toward Sunday, prayerfully consider how baptism links you spiritually to God the Father, God the Son, and God the Holy Spirit. Finally, ponder how you might more fully live into your baptism as a transformed child of God. I hope to see you in worship on Sunday.